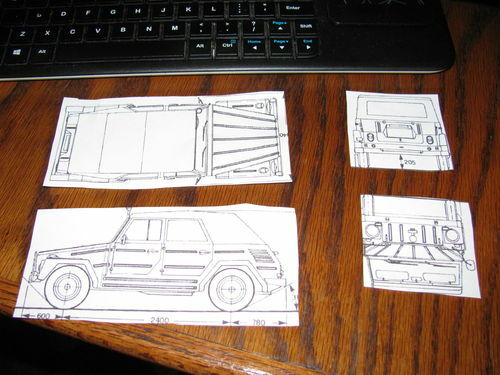 Planing a scratch build model car. 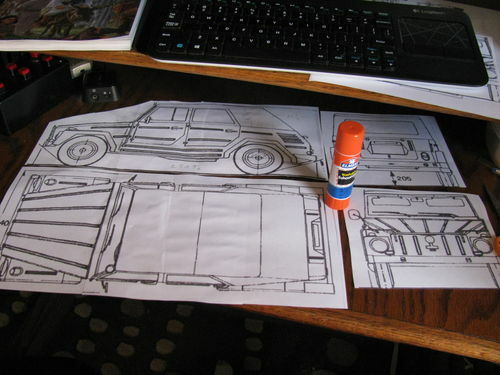 After building Dutchy’s VW Bus [truck] I got it in my head to build the VW Thing which has all square side panels so should be a great first model build for those wanting to try wooden model building with limited tools..
Having already build a Toys and Joys project or other models will be a plus as you will already have an understanding of how plans printed in full size can be used to build a model. I know there are artists that can draw their own plans but this is for us mortals, we just need a line drawing or two for our dimensions. 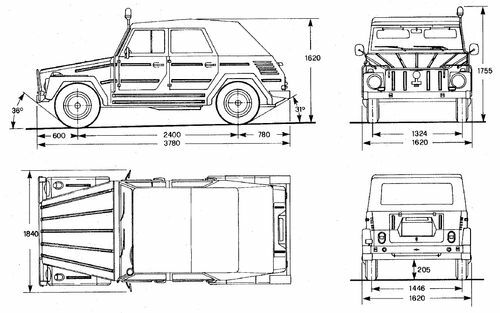 I found a great picture, using Google search [thing plans] of the Thing drawn out with a top, side, and front view and that’s all we need for now to get started. Here’s the picture it’s a based on. I should have put something to show the scale but the main body picture is only 5 1/2” long. By trimming the extra paper around the sides it makes it easier to put it where it needs to be for printing. We need to figure how large to make it. For me I all ways start by how big the wheels need to be. Most of your T&J plans use something around 2 7/8” [for car tires] so I try for 3” and by the time I get them sanded down 2 7/8 will be close. So using the 2 7/8 wheel as our starting point I now take the plan [picture] to the printer -copier and print out the picture. In most cases the model we will be making will be larger than the copier can handle so we’ll be only coping parts of the plans at any one time. In this instance we’ll need a front and back copy and then we will cut off the end of one picture and glue it to the other so the front and back match up. But first we need to find the right % to enlarge the plans. 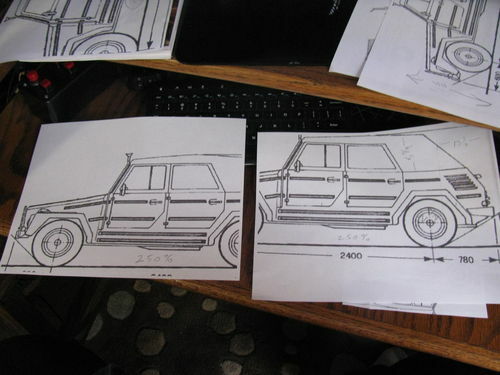 In the first picture the wheels are 1” so I’ve got to enlarge till I get to 3”. It may take a couple a tries before you hit the right %. My first try I enlarged to 200% using the printer settings and my wheel print out came out as 1 7/8” so we need to go on up. My next try is 300% and the wheels come out at 2 7/8” which is just right for the tires but I look at the print out and the car is huge!!! It would be just right for someone wanting to put in a ton a details as it would be 7” tall and around 16 ” long. I don’t need giant models so I’m going a tad smaller lets see what 250% looks like. That gives me a tire just under 2 1/2” and a length of 13 1/2 and 5 3/4 high, just right for my needs. 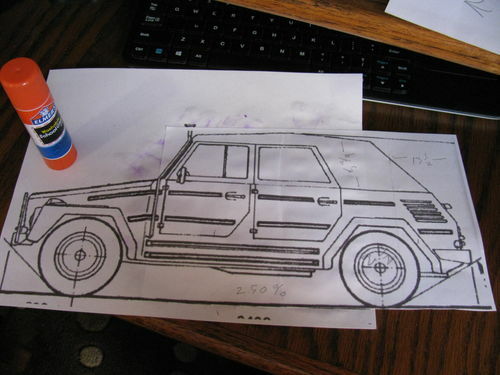 Just a note= The tires on the Real Thing must be quite small to work out like this but that’s fine by printing out these exact drawings of the car we know every thing is in scale and should look the right size when finished. Now glue the two parts together, and now we can see the size of our model and no measurements are needed all the parts are here to be printed, cut out, and glued to some wood for cutting and shaping. I did the same for the top and printed out the front and back. So now I have my plans, all at the right scale. Now as I need a part, I’ll print it out and many times I’ll print out more that one just in case. I can go through a lot a paper and ink but that’s the price you pay for a one of a kind scratch built model. As always there’s a hundred way’s to do this but this is what I use as I can’t draw a straight line. For me the copier printer is a tool I can’t do without, now a days their dirt cheap, it’s the ink that costs but there are Co. on line that sell ink very cheap. And one other thing about printers if it tells you, you need to change ink keep using it you’ll be surprised how much ink is left to be used. I plan a HowTo about it if and when we get some warm weather in this neck of the woods, that is if I don’t get side lined by some other project. If you need to make a picture half the size it is, the quickest way for me is to go into the print program in Windows and set the printer to make two picture on one page. This will print out a picture on only half the page and wala you got a half size picture or part. This also works for 1/4 or there is even a setting for nine pictures on a page. This was very helpful when I was making mags for my wheels. I had a picture but it was way to big. Play with this tip it works. I’s looking forward to following this one. I always enjoy your build blogs. This one will be no exception! It’s to cold to get in the shop so playing on the computer is my other way to feed the wood working addiction!!! And thank John and sras, glad to hear I’m not typing to myself again. No don’t type that but it’s the truth but still you don’t need to let everyone know you type to your self, now just stop it!!!!! I always check out your work, even if I do not comment every time. I find your posts most interesting and informative as well. Some of the mutterings lead to having a different approach to tasks so I am not really concerned about it. So I am looking forward to seeing what eventuates. Like the “simple” approach #4. Your description and detail is #1. Neat tip about fractional printing, however, do you have a methodology for more precise scaling? What I am alluding to is that you mentioned 3” wheels… how do you tackle the task if the original picture/sample you are working from is say 12% +/- different to your requirement. I have forever fought the battle of printing to scale (after achieving the length). I have never been able to relate a photo with print until I came across Matthias Wandel’s big print program many years ago (though at a cost probably more than I paid for it). I have never been able to relate a photo with print until I came across Matthias Wandel s big print program many years ago (though at a cost probably more than I paid for it). Ducky there’s nothing stopping me from adjusting to odd %, instead of 300% or 200% ,, 214 is no problem just type it in the printer software program. Print it out and if still not right add or subtract a %. but just don’t do enough where I’m paying for that. That’s one reason I try to stick with line drawings, they’ve all ready took out all the distractions, and in most cases the drawing is setup for a one page print so no need to bother with over sized pictures. Not quiet… he says loudly. For this exercise, line drawings, JPGs and PDFs, I tar with the same brush. For arguments sake, you print off any one of those and get a wheel in an unorthodox fraction to the size you desire. Do you then reduce/increase it by trial and error till you get a close enough fit or do you persist to certain tolerances? Sorry #4, just being the devils advocate! Totally agree with your take on the Big Print, however, when I had nothing better I found that parting with the shekels saved me enough time to justify the cost (I value my time highly… and don’t say… then, why waste it crapping on…). What program do you use to resize, print, process? I’m going to have to add this one to my memory bank as it will for sure come in handy one day, thank you Bruce. From the start of my thread I said I pick a wheel size then enlarge the picture to fit my wheels. So there’s no odd tire size the model is printed out to fit the size of the tires I want to make. If I need to make the wheels a tad bigger or smaller I don’t need a program for that my tire sizes are limited to what hole saw blades I have on hand. I’m not that worried about exact sizes, I’m building a model not an exact replica for a museum or something. I think your looking at this from a bought plan point of view where you have to do what the plans say. I’m building a scratch build so all that goes out the window and I’m freed to choose any size I want and come at it from any direction I please. But this also put more pressure on me because I now have to make all the decisions as to how it all works out. I guess this way of building isn’t a true scratch build because I am using a drawing as a plan [to help keep the scale right] just not a bought one with all the helpful hints. Ducky It’s all done with the printer scanner. I put the drawing in the scanner and have to go deep in the menu to find the screen that lets me pick any % I want to make it from 25% to 400%. With my Brother [brand name scanner] I do this. It has serves my purpose so far but it is quite frustrating to need to drill down this deep every time I need to print out something. When I first started building I tried to size things with the Windows Paint program and ran out of the room screaming, I’m sure it can be done but not worth the time to figure out. That’s when I found that printing two pictures to a page tip for shrinking things down.. Going off the deep end with this one aren’t we..
Quit typing but I need to answer this one last thought NO! QUIT!!! But there’s this one point. AAAAaaaaaaaa!!!! As I may have alluded to before #4, I have SU to do my resizing. I’m sure there may be one or two people out there that have not paid for the full SketchUp Pro version… you poor few tragics. Forgive me, but as I mentioned I am playing devil’s advocate as there may be many of your readers out there that could learn your intimate tricks, but are too afraid to ask… you do have scary looking fingers. I did observe (sorta) you mentioning that you picked a wheel size, however, I didn’t think it was governed by holesaw availability… would have though (not sure why) that you might have used a circle cutting jig as a backup… however, now on hindsight, I cant remember you using one… but then again I may have read over that picture. You read a tad more than me… I have an Epson MFP printer (probably similar to yours), however, if I RTFM, I’m sure there’d be more features than the ON/OFF button. I’m guessing than by using your big Brother method outlined above combined with a more advanced calculator than fingers and toes, you could measure the print, calculate the exact +/- ratio and key that in to get your exact size (rather than trial and effort). I’m sure your tip will serve many readers well. Keep it up and just persevere with my stupid questions. PS. Any options for less than 25% change? ... started… Windows Paint … not worth the time to figure out. Know the feeling… That’s why I always look for an easier alternative, if not necessarily cheaper. Don’t need it so no worry’s. I did get one at a yard sale but from what I have seen on some videos not really interested in using it. Scary!!!!! I came across Matthias Wandel’s big print program many years ago (though at a cost probably more than I paid for it). I’m glad you mentioned this program because it sounds like a winner for most of what we are doing. Ducky your way passed needing this blog but hope I made myself clear enough for others to find it useful. Here’s a tip for those that find something interesting on SketchUp and can’t figure out how to get it off the page. Use Windows own Snapping Tool to get it copied from the screen. It is a simple screen capture tool. This will also work on those sites that won’t let you copy a picture you need. 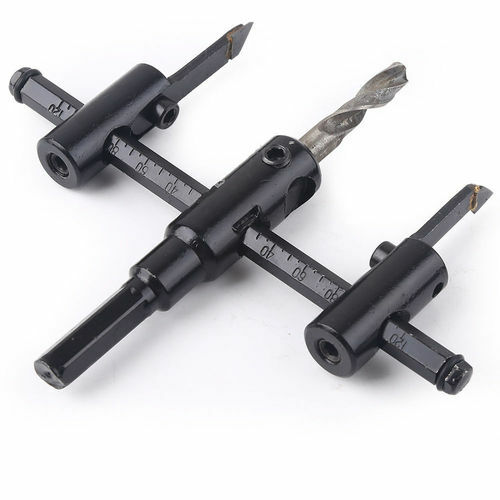 When I said hole drilling jig I was thinking of these. I really like your VW Thing I have saved it all so I can try it soon. Got one of those Bruce and for sure they are one very scary holes sawing too & that’s in a slowed down drill press with the job securely clamped… mine is in the cupboard gathering dust! !